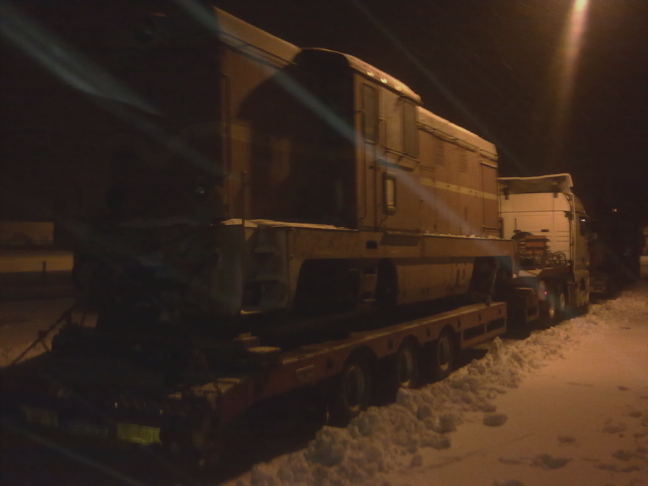 This entry was posted on Friday, 17 February 2012 at 21:13 and is filed under Smigiel Railway. You can follow any responses to this entry through the RSS 2.0 feed. You can leave a response, or trackback from your own site. The best way of describing this is asset stripping. How long before the council decide that there is cash in the rails between Smigiel and Wielichowo, and the freight interchange sidings (which as well as being blocked, are redundant as the council has sold the transporters for scrap). Perchance it is not dead but sleepeth, but it’s going to take some waking up the way this is going…. Definitely a case of killing the goose that lays the golden egg. Smigiel council have made around 400,000 zloty from selling the railway’s assets in the past six months, 10,000 zl each for the 33 transporter wagons and 50,000 zl each for these two Lxd2s. The question is – how much of this will be reinvested in the railway? 400,000 zl to improve the track, renovate passenger stock and employ staff would set the preserved railway off on a good footing, but I fear a lot of it will end up in the council’s general coffers.